• Heavy-duty vinyl coated waterproof cloth backing with excellent flexibility. • High tack tape with excellent adhesion for superior performance. • Non-reflective backing for low gloss. • Retains flexibility and conformability in both low and high temperature applications. • High thread count for a clean tear (tear may still be on an angle though). So the price is pretty good, particularly for 60 yards, and the quality appears to be good on this tape, but I've had it leave a little bit of residue on cables and hardwood floors so far. I was able to get the residue off by sticking the sticky side of the tape to the residue a few times, but gaffers tape shouldn't leave residue. It has generally worked fine, but again, I've had a few incidents with it leaving residue. 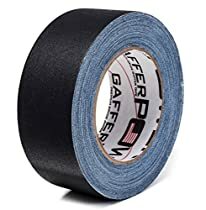 I've bought polyken gaffer tape in the past, and it was fantastic, worked great with no residue, but I think it was a different series than the 510. This 510 series is thinner than the previous polyken gaffer tape I bought in the past, so pretty sure it's not the same one. Also, the cardboard roll on this tape is totally white, whereas the old polyken tape I bought had "polyken" printed on the cardboard roll. I'd still recommend this tape, compared to some of the other gaffer tapes I've tried. 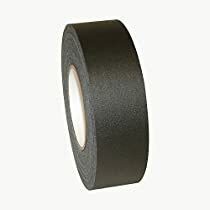 This is cloth tape, it generally doesn't leave any residue, and sticks great. I've just had a couple incidents with residue, but no actual damage has resulted fortunately. 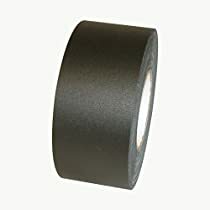 Needed carpet tape for an event and found this online for half the price of our local music store. Purchased it and have fallen in love. Easy to control the adhesive and doesnt leave any adhesive behind when you pull it up. Great product. Just love this thing. the sensor is perfect. lights up when it detects movement. it's lightweight. pretty much sticks to anything and just bright enough to get the job done. Love it. would buy again..